GMU Bhangra was established in 2007 by a group of Punjabi-Indian students. Their goal was to spread the Punjabi culture, within their college and community, through traditional folk dance. This year, they have gone above and beyond expectations and placed second at the most prestigious collegiate competition in the nation, Bhangra Blowout 23. Their technique, creativity, and boldness have put them on the map and now they are a force to be reckoned with! We hold tryouts every Fall and Spring semesters. We also perform in our local community and at University events in order to gain the interest of current and future Mason students. We try to gain their interest via school events and tryouts every semester; the goal is to get as many freshman to join so they can carry on the team for the years to come. We train them over the summer and have them perform at local gigs and festivals throughout the year. For the season that has just passed, we have achieved our goal of making a placing set; we placed first and second at both of the competitions that we went to. For the coming season, we want to train as many freshman and undergraduate students as possible so we can hand the team off to them. Us seniors will still help in making a new set along with training and guiding the new team on how to prepare for the upcoming competitions. Making a bhangra set that is impactful for the collegiate teams in the circuit and keeping true to the basics of bhangra, yet adding our own creativity to it, are the biggest challenges. Another challenge is having dancers on the team match each other - execution, energy, and stage presence wise - especially when it's a team that consists of commuters because not each person can make all the practices. The thing that we like most about everyone is their passion for bhangra and food. Also, their fun-loving and childish nature keeps practices relaxed, especially when competition season heats up and gets stressful. The reason we all work so well together is because we have bonded over our unique combination of folk and modern style dance. We have implemented this for the past 5 years and it never ceases to amaze us how dedicated everyone is. We stick to the folk and traditional elements of bhangra, while adding our own creative touch through our choreography. Team dinner at Denny's, right before going to a competition, and constantly playing "Na Na Na Na" by J Star every where we go to get hyped up. We also annually perform at our University's International Night Competition along with other teams that represent India. Nothing fancy, just: "5,6,7,8 GMU --- BHANGRA" (done with jhummer hands). Our recent performance at Bhangra Blowout 23, because we competed and placed with this set twice within two weeks and got very positive feedback from the top judges in the circuit. 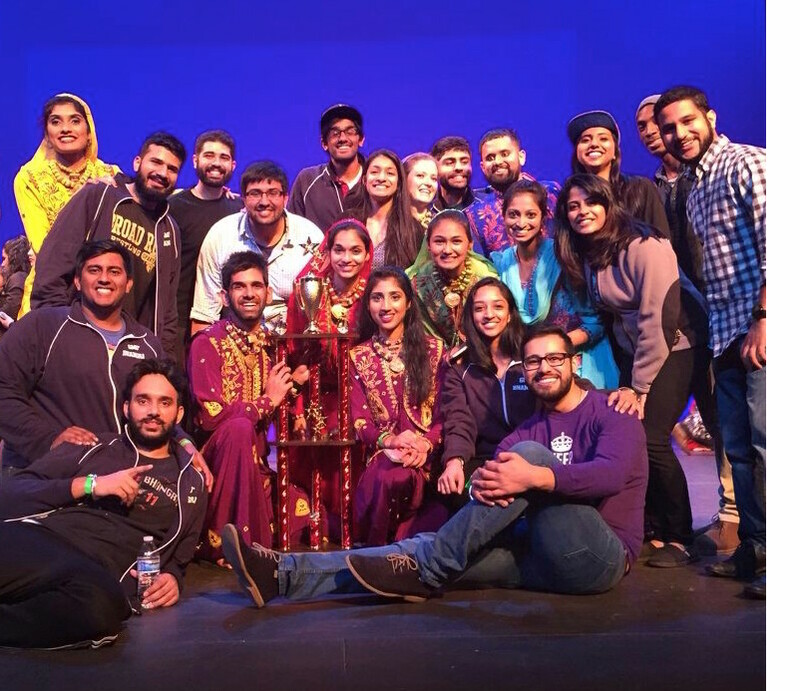 When we recently won 2nd at our home competition in D.C. and got recognized as the top two collegiate bhangra teams in the circuit this season; all our family and friends were there to support us and witness our best set to date. Our team consists of dancers from ages 18 to 28 at times. We have competed at about 20 competitions since 2011, from California to NYC. We have also held a summer bhangra camp for 3 years but now that has branched out as a bhangra academy called VSB in Manassas, VA.